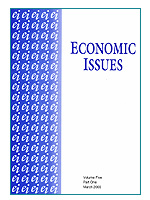 It is the policy of Economic Issues to publish articles on a wide range of subjects and issues of current economic debate. Subject to professional standards being maintained, the journal will allow authors considerable freedom in how they treat their subjects. Papers are particularly encouraged, however, which contribute to public discussion and which are applicable to the practical concerns of decision-makers. Papers which provide an accessible survey of a field of economic debate are also actively encouraged. Explain current research ideas and findings from a broader economic perspective. Approach and present issues in a way that renders them appropriate for classroom and student use. Help to keep business, government and economics in general aware of developments in economics thinking. Highlight and put in historical perspective contemporary issues and debates. Emphasise the implications of theory and empirical evidence for economic policy and business practice. Question conventional wisdom and adopt a broad (inter-disciplinary), institutional and/or evolutionary approach to economic ideas. Recognise and deal with the European dimension, provide comparative studies and take account of the interdependence of modern economies. Raise issue and develop approaches that relate to the teaching of economics in particular and economics education in general. In order to promote the widest possible dissemination of research published in Economic Issues, in the most timely fashion, the Board of Trustees of the Charity have approved the following policy for Gold Open Access. Once a paper has been accepted for publication in Economic Issues; and upon receipt of payment of the Article Processing Charge (APC), but not before, the author(s) can make available a post-print version of the paper on all public forums, for example on institutional repositories, subject repositories (eg RePEC) and personal websites. Once a paper has been published, the authors will be provided with a Version of Record (VoR) which can replace the post-print version. The Version of Record will simultaneously be made fully and freely available via the journal website. The APC for Economic Issues is set at £100 and enables the author(s) to see that their article enjoys immediate, full, global access. Authors will also receive three hard copies of the volume of the journal in which the article appears. Authors can, alternatively, take up the Green Open Access policy of Economic Issues. In this case, there will be no APC. There will be a 12 month embargo period, after which the author(s) can make publicly available the post-print version of the article. The Version of Record of articles published under this route will be made freely available on the journal website only after 24 months from date of publication.